Kyoji Horiguchi discusses his upcoming fight against Bellator champion Darrion Caldwell with hopes to crossover and win a second title after they face off in Japan. Kyoji Horiguchi is all about the biggest opportunities available to him. The former UFC flyweight title contender has been running rampant in RIZIN since signing there last year with seven straight wins in mixed martial arts including a run through the first ever bantamweight grand prix. Horiguchi even accepted a challenge earlier this year against 20-year old kickboxing sensation Tenshin Nasukawa just because he could. Now Horiguchi has arguably the most high profile fight of his career on deck at New Year’s Eve at RIZIN 14 where he faces Bellator bantamweight champion Darrion Caldwell in a rare crossover event between promotions. This was one more rare opportunity that Horiguchi just had to jump at. “I’m happy to face the Bellator champion [Darrion] Caldwell. I have very good motivation for myself to face him and also this is a great test for myself to see how much I can do against those top notch fighters,” Horiguchi said when speaking to MMANews. Now there’s no doubt that this will be an uphill climb for Horiguchi because he’ll be giving up a lot of size to the former NCAA wrestling champion. Caldwell just recently competed as a featherweight in Bellator and will have five inches of height over the Japanese superstar when they face off. Add to that, Caldwell is a world class wrestler and Horiguchi knows he’s in for a very tough matchup when they clash in December. 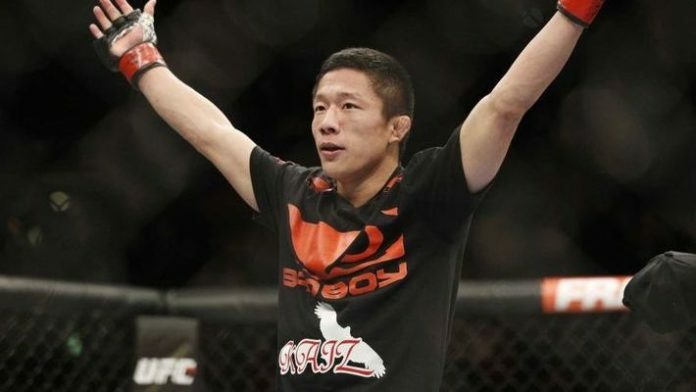 While Caldwell may have some physical advantages, Horiguchi is still confident that he can overcome him with a better skill set, especially when it comes to his striking. If all goes well on Dec. 31, Horiguchi will become the RIZIN bantamweight champion but he won’t be finished by just winning one championship title. “After I win the fight, I want to go to Bellator in the U.S. and challenge the Bellator champion there. This one is for the RIZIN title belt,” Horiguchi said. For now, Horiguchi will begin preparing for the showdown with Caldwell in Japan as they face off in one of the featured bouts on the RIZIN 14 card that will also showcase a special exhibition match between Floyd Mayweather and Tenshin Nasukawa. Ultimate Fighting Championship (UFC) president Dana White wants Tony Ferguson to be evaluated by doctors before he can compete again.